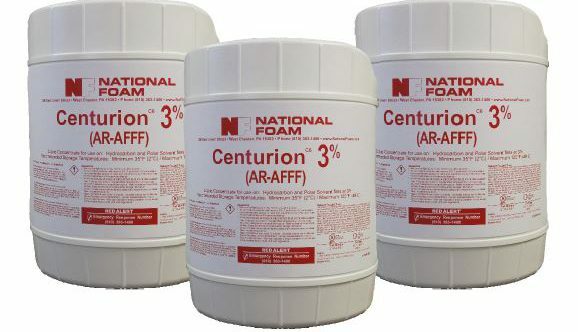 Environmentally responsible Centurion is the next generation in Alcohol-Resistant Aqueous Film Forming Foam (AR-AFFF). 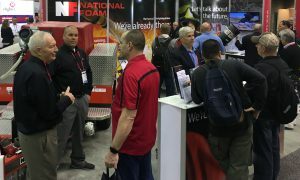 This economical formulation demonstrates National Foam’s commitment to superior flexibility, firefighting performance, and environmental responsibility. Centurion is used to extinguish hydrocarbon and polar-solvent (water-miscible) fires. It is suitable for use with foam compatible dry powder extinguishing agents. Centurion is an AR-AFFF concentrate with a special biosynthesized polymer. This polymer is designed to fulfill two functions. 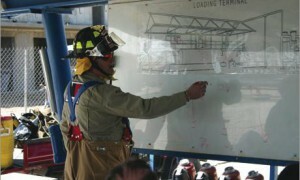 The first is to form a protective membrane between the fuel and the foam as it contacts the water-miscible fuel, making extinguishment possible. 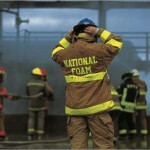 The second function is to make the foam more stable and heat-resistant, resulting in better burnback resistance and sealability compared to conventional AFFF’s. The concentrate formulation is recognized by United States Patents 4,999,119 and 5,207,932.